I was running out of time for dinner tonight. My munchkin had a runny nose so I wanted to cook something healthy with vegetables. And I wanted this toddler to also eat those vegetables, which can be a challenge. So I looked through some of the recipes I’d saved from the Instant Pot Facebook group. I found one for a vegetable soup that looked pretty easy. I gave it a whirl. I had a few challenges with the Instant Pot where it wasn’t coming to pressure properly. I think it was just too full of soup. However, it eventually came to pressure. Yet the timer didn’t start counting. After waiting for 30 minutes (it usually takes 15 minutes to come to pressure), I did a quick release. Thankfully, the soup was done so no big deal. Next time I think I’ll probably make slightly less of this so that it all fits in the Instant Pot. 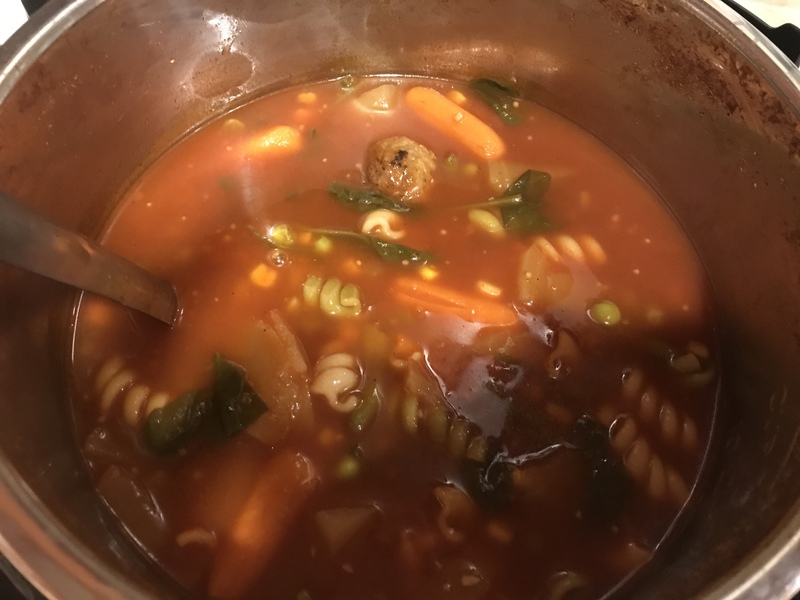 The biggest win was that my toddler and my husband both ate and liked the soup… a soup full of veggies! Combine all ingredients in Instant Pot, cook on manual for 6 minutes, quick release. So yummy! Substituted tomato sauce in the can for the tomato juice. Used one part sauce + one part water to equal the juice. (Didn’t have tomato juice on hand). I used 2 15 oz cans + 30 oz water. This made 15 oz too much, so I saved that for a different recipe. Next time I will try just one 15 oz can + 15 oz water and reduce the other water to 43 oz if I did my math right. This would help with the Instant Pot being too full. Substituted powdered beef bouillon for the better than beef bouillon. I only used 4 teaspoons instead of six. Served it with hot pepper flakes for myself and hubby, because we like it spicy. I made buttered multigrain toast broiled in the toaster oven to go with the soup. I tried out my new garlic seasoning from Johnny’s that I recently got from Costco. It was good. My toddler liked it better if I removed the noodles and meatballs “separate.” I helped her eat the soup part because she spilled once and was very bothered by the stain on her heart sequined sweater.